One of these days I swear I’m going to make croissants, but until then I will be constantly buying croissants to make this wonderful Croissant Sandwich Recipe! Ok. If I’m being honest, I’ve tried to make croissants a few times and never ended up with anything remotely edible. So I buy them from the bakery and they are absolutely perfect for these cheesy croissant sandwiches with a fried egg! Remember that in the kitchen the perfect is the enemy of the good (and also the good breakfast). I would happily serve these to a hungry crowd during brunch and your guests would be very happy with them! Toasted croissants with fried eggs and lots of veggies make for one of my favorite breakfast sandwiches. Messy, hearty and delicious! 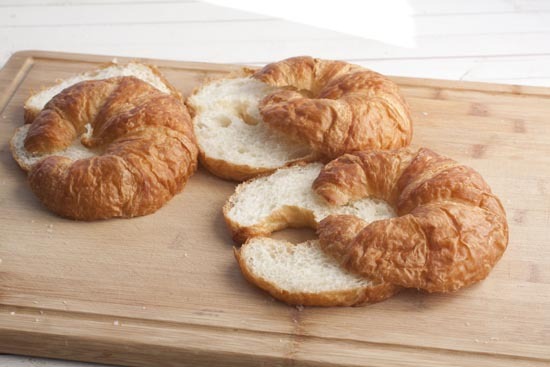 2) Slice croissants in half carefully and lay them on a baking sheet, cut side down. Toast in the oven for 5 minutes at 400 degrees. 3) Remove croissants from oven. Top with sliced avocado, red onion, and tomato on bottom half of croissant. Sprinkle grated cheese on top half of croissant. 4) Return to oven for 3-4 minutes. 5) Add a small dab of butter to a nonstick skillet over medium-high heat. Once melted and bubbling, crack in four eggs. Cook for about 90 seconds on the first side until most of the white is cooked. Carefully flip eggs. Try not to break the yolks. Turn off the heat and let the eggs continue to gently cook. 6) Remove croissants from oven. Add two fried eggs to each croissant bottom. Top with sprouts and a pinch of salt and pepper. Add cheesy top of croissant and serve immediately! Like I said, croissants are solidly in my buy not bake column. Obviously to make a sandwich out of these guys, you’re going to need to cut them in half. This can be a bit tricky because croissants are so flaky and light. A good bread knife really helps with this process. If you don’t have one, you’ll probably squish and smash your croissant. The sandwich should still be tasty, but it just won’t be as pretty. You can also use a serrated steak knife if you are careful. A good bread knife helps. Before you start topping the croissants, lay them cut-side down on a baking sheet and toast them in a 400 degree oven for about five minutes. That will just firm up the bread a bit and make it nice and crispy. A lot of toppings would go well on this Croissant Sandwich, but these are the things I used on this day that worked really well. I diced up some onion, sliced some tomato, sliced an avocado, and grated some cheese. I like to toast all of this stuff on the croissant before making the sandwich. It keeps the ingredients nice and warm. So, when your croissants are done with their five minute face-down toast, take them out and flip them. On the croissant tops, just sprinkle on some grated cheese. 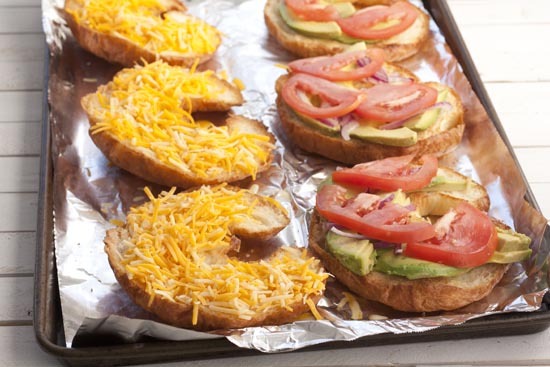 On the croissant bottoms, add your avocado, onion, and tomato. This is a good spread, for sure! Stick these back into a 400 degree oven for about 4 minutes and then they will be ready to use. This won’t come as a shock to any longtime Macheesmo readers, but I don’t think there’s any substitute for a good fried egg on a sandwich. It needs to be over-easy so the yolk is runny and messy. The messier the better really. 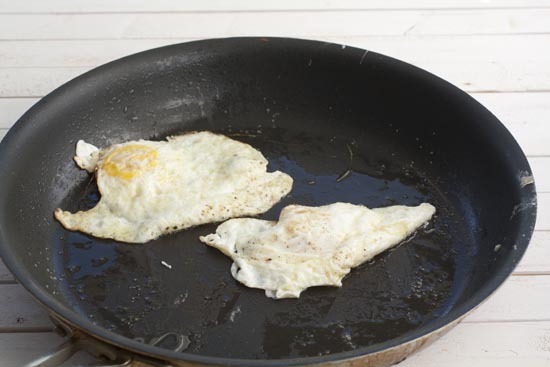 This is how I fry my eggs to get the perfect over-easy egg, every time. Add a pad of butter to a large nonstick skillet over medium-high heat. Once it is melted and bubbling, crack in your eggs. Cook them for about 1.5-2 minutes until most of the whites are cooked and then gently flip them with a spatula. Once the eggs are flipped, you can kill the heat on the stove. The residual heat in the pan will finish cooking the eggs. I think lightly fried is best. Add your eggs (two per croissant sandwich) to the toasted croissant bottoms and season them with a sprinkle of salt and pepper. 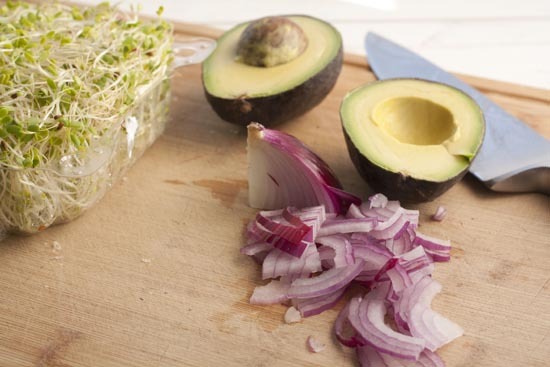 Add some sprouts if you’re using them and top the whole sandwich with the cheesy croissant top. Slicing it just makes it easier to eat! This sandwich is messy and hearty. 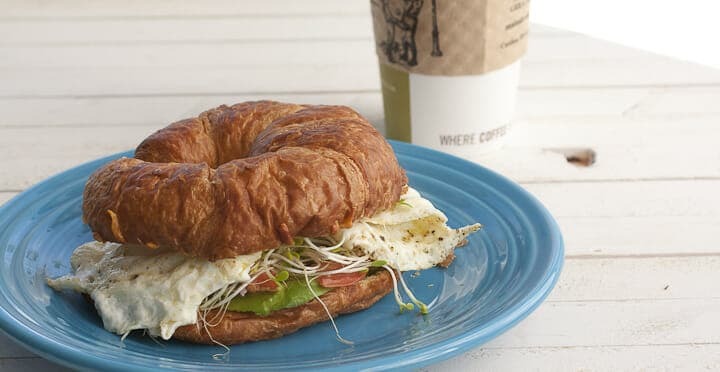 I like to eat this croissant breakfast sandwich before going for a hike or something. It gives you lots of energy to tackle your day. This sandwich looks delicious! I made something similar this morning–over easy egg, cheese and ham. But seriously, you are so clever, CROISAIN’TS! I hope to learn how to make croissants some day, as well. Oh my goodness!!!! Just made these and they are delicious! Even though I forgot the tomatoes!!! And my husband, after the first bite, held the sandwich up and exclaimed, “these are pretty good” (an improvement to the dry breakfast sammies I usually make). Thanks for your recipe…. Next time, tomatoes for sure. A friend gave me an extra croissant after bridge yesterday, so I used this recipe for breakfast this morning. Having no sprouts, I used arugula instead. Next time I will sauté the onions first to soften them, then use the same skillet to fry the eggs. I cubed 1/2 a fresh mango to have with it. Quite a nice breakfast.